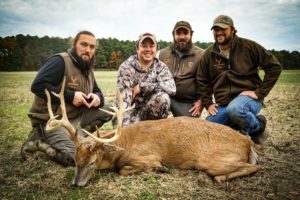 Talbot County Outfitters is a small outfitter owned and operated by hunters whose passion in life is the outdoors. With over a combined 60 years experience in the hunting industry, we know what it takes to be successful. Whether it is putting in the endless hours of scouting with binos, checking trail cams or moving stands to get that extra 10 yards of advantage we try to always stay one step ahead. Our land consists of privately rented in which deer are properly managed from year to year and over half, we have had possession of for over 20 years. The landscapes of our properties vary from hardwoods, open timber, fields, pine thickets, river banks, and tidal marshes. Each plot of land is chosen carefully and rented for the quality of deer NOT to gain acreage.